A major study sheds new light on the role of carbon dioxide once it's transported to the oceans' depths. The research indicates that instead of sinking, carbon dioxide is often consumed by animals and bacteria and recycled in the "twilight zone," a dimly lit area 100 to 1,000 meters below the surface. Because the carbon often never reaches the deep ocean, where it can be stored and prevented from re-entering the atmosphere as a green-house gas, the oceans may have little impact on changes in the atmosphere or climate. The research is the result of two international expeditions to the Pacific Ocean, and is published in the April 27, 2007, issue of Science. "These results are particularly important to our efforts today to improve the predictive capacity of numerical models that relate ocean carbon to global climate change on different time scales," said Don Rice, director of NSF's chemical oceanography program. It also adds a new wrinkle to proposals to mitigate climate change by fertilizing the oceans with iron--to promote blooms of photosynthetic marine plants and transfer more carbon dioxide from the air to the deep ocean. "The twilight zone is a critical link between the surface and the deep ocean," said Ken Buesseler, a biogeochemist at Woods Hole Oceanographic Institution and lead author of the new study, which is co-authored by 17 other scientists. "We're interested in what happens in the twilight zone, what sinks into it and what actually sinks out of it. Unless the carbon goes all the way down into the deep ocean and is stored there, the oceans will have little impact on climate change." Buesseler was the leader of a project funded by the National Science Foundation (NSF) called VERTIGO (Vertical Transport In the Global Ocean). The twilight zone acts as a gate that allows more sinking particles through in some regions and fewer in others, complicating scientists' ability to predict the ocean's role in offsetting the impacts of greenhouse gases. These sinking particles, often called "marine snow," supply food to organisms deeper down, including bacteria that decompose the particles. In the process, carbon is converted back into dissolved organic and inorganic forms that are re-circulated and reused in the twilight zone and that can make their way to the surface and back into the atmosphere. The problem, say scientists, is that particles sink slowly, perhaps 10 to a few hundred meters per day, but they are swept sideways by ocean currents traveling many thousands of meters per day. To collect sinking particles, oceanographers use cones or tubes that hang beneath buoys or float up from sea floor. That, Buesseler said, "is like putting out a rain gauge in a hurricane." 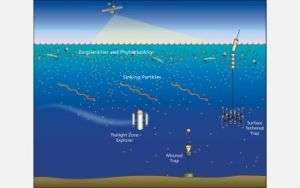 While many studies have investigated the surface of the ocean, little research has been conducted on the carbon cycle below. The VERTIGO team examined a variety of processes to open a new window into the difficult-to-explore twilight zone. They successfully used a wide array of new tools, including an experimental device that overcame a longstanding problem of how to collect marine snow falling into the twilight zone.